I'm thrilled to announce that I was asked to collaborate with VIDA. They are a new kind of fashion ecommerce company that connects artists like me all over the world with producers to bring our work to life. My designs will be used to make high-end unique products such as beautiful lightweight scarves, chic geometric cut tops, and much more in a socially conscious way. They have ethical standards for the makers of these original products. Plus, the best part is that for every product sold, VIDA provides the gift of literacy to the manufacturing factory employees so that they have the opportunity to learn to read, write, and do basic math. Therefore, I am honored to be able to have the opportunity to work with this amazing sustainable organization. Below is my favorite item from the collection. I hope you like this new design. 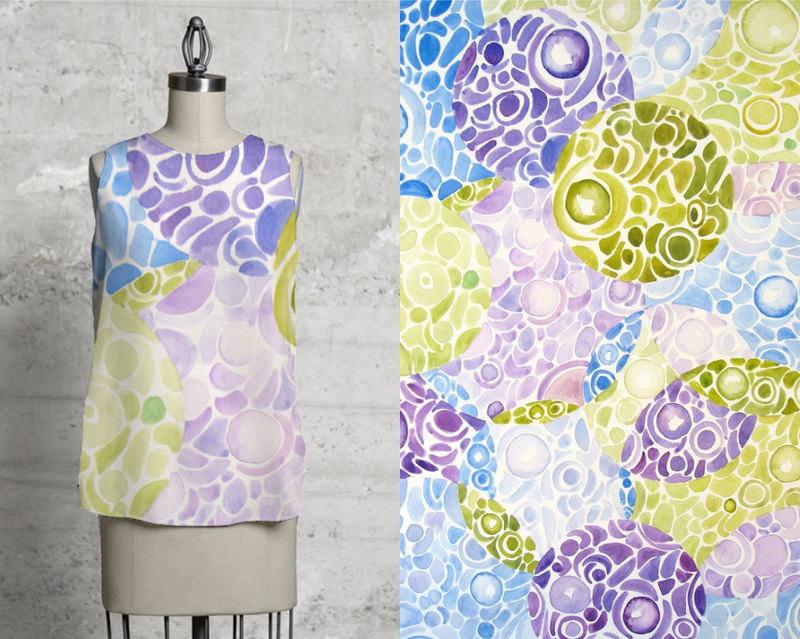 I have been exploring with color and abstract art so I thought this geometric pattern would look great on this beautifully designed top. I also made sure to use soothing calming colors such as mint green, lavender, and sky blue. Have a great night my lovelies!